We love Italian castles as you already know; let’s go further with our seasonal trip discovering the beautiful architecture of this masterpiece (sometimes they are also UNESCO sites). Today we go to Northen Italy and we will stop first to Soave. . This is a small wine town is enclosed by its medieval walls and topped by a castle. The town is in Veneto region, near Verona “the city of the lovers”. The scenario is breath-taking: the manor is surrounded by vineyards producing the famous Soave wine. We can continue and land in Emilia Romagna, visiting Ferrara on the Po Delta. The walled Renaissance city brings about a lots of great examples of Romanesque and Gothic architecture. 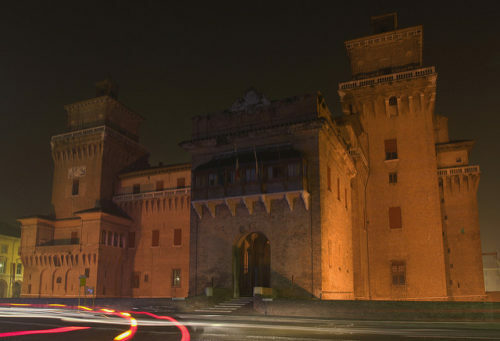 Its astonishing medieval castle, Castello Estense di Ferrara, is in the old town. Torrechiara Castle are instead located near Parma. Torrechiara is indeed very old and beautiful: the architecture and the structure traces back to the 15th century castle and inside we can find some unusual frescoes. Forte di Vinadio is located in the picturesque countryside inside the Stura Valley in the beautiful Piedmont, between Cuneo and France. The manor was built for King Carlo Alberto and it was an important 19th century fort. Forte di Vinadio is open mid-May through October. You can’t miss Castel dell’ Ovo (literally “EGG CASTLE”), which is the oldest castle in Naples. It dominates a beautiful position in a little island in Naples’ harbour. The original city was founded here in the 6th century BC. The castle nowadays is well-known for the international exhibitions and the numerous concerts. A curiosity: it is also a popular place for…weddings! The Castel Nuovo is a huge castle erected in 1279-1282, and it hosts the Civic Museum with 14th-15th century frescoes and paintings, silver, and bronzes from the 15th century to present. This entry was posted on Wednesday, November 7th, 2012 at 5:05 pm	and is filed under Events in Italy. You can follow any responses to this entry through the RSS 2.0 feed. You can leave a response, or trackback from your own site.